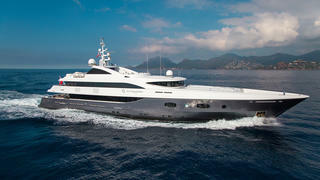 The 46.2 metre motor yacht Allegria was built in steel and aluminium by Dutch yard Hakvoort to a design by Vripack and delivered in 2004. Lloyd's classed and MCA compliant, her Glade Johnson interior accommodates up to 11 guests in five cabins comprising a master suite, three doubles and a twin cabin with an additional Pullman berth. All cabins feature interiors in fine marble plus cherry wood joinery with maple burr accents and have state-of-the-art entertainment and music systems plus en-suite bathroom facilities. 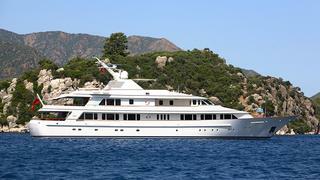 Built in steel and aluminium by Italian yard Codecasa, the 62.5 metre motor yacht Apogee is Lloyd's classed and MCA compliant, with delivery in 2003 and a refit in 2009. Her interior by Franco and Anna Della Role offers extraordinarily flexible accommodation, sleeping up to 18 guests in seven cabins including two Pullman berths and a double staff or guest cabin with a further two Pullmans, all finished in mahogany and all with en-suite bathrooms. Built in aluminium by the Dutch yard Heesen to ABS class and launched in 1990, the 44 metre motor yacht At Last underwent a major interior refit in 2014 by international designer Tui Pranich. During the refit, her interior was completely updated. Accommodation is for eleven guests in five cabins consisting of a master suite with 180 degree panoramic views, plus four additional cabins, including two mirror-image double cabins, a VIP king cabin, and twin cabin with Pullman berth, all with large windows, entertainment centers and en-suite bathroom facilities. 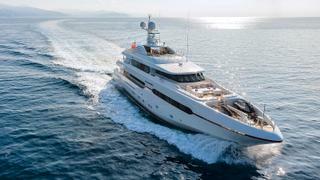 Making her boat show debut, the 45 metre motor yacht Atomic was built in steel and aluminium by Turkish yard Sunrise Yachts to Lloyd's class with delivery in 2014 and has had the same owner since new. Her interior, by Darnet Design, features light oak panelling and fine marbles, accommodating up to 11 guests in five cabins. These consist of a master suite, three doubles and a twin plus a Pullman berth, all with satellite televisions, entertainment centres and en-suite bathroom facilities. Sporting an unmistakable Feadship profile, Bella was launched by the Dutch yard in 2008 as part of the F45 Vantage series and refitted extensively in 2014. She can accommodate up to 12 guests in six luxurious cabins including that much-sought-after premium feature: a main deck master suite. Twin MTU 12V2000 M70 engines propel her to a top speed of 14.5 knots and her zero-speed stabilisers ensure total comfort, both underway and at anchor. 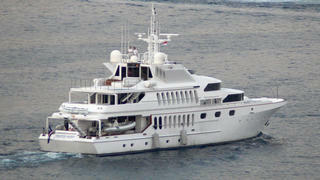 Built in GRP by US yard Christensen to ABS class, the 50 metre motor yacht Casino Royale was delivered in 2008 as the largest yacht in the yard’s Millennium Edition series. A lavish interior by Carol Williamson accommodates up to 12 guests in six cabins consisting of a main-deck master suite, a full-beam VIP suite, two doubles with queen sized beds and a further two twins, all with entertainment centres, satellite televisions, access to the Kaleidescape on-demand video and audio server, and en-suite bathroom facilities. The 28.95 metre motor yacht Cristobal was built in GRP by UK yard Princess Yachts to RINA class and delivered in 2009 with a major refit in 2014. 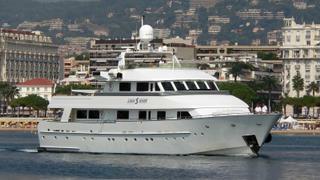 Generous accommodation is for eight guests in four cabins. These consist of a master suite amidships with a king sized bed, a VIP suite forward with a king sized bed, a double with a queen sized bed and a twin cabin convertible into a double. All cabins come with television screens, entertainment systems and full en-suite facilities. 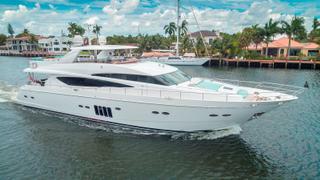 Launched by Trinity Yachts in 2001 and refitted in 2012, Dorothy Ann is an all-aluminium raised pilothouse yacht with a notably large sundeck, ideal for catching a few rays. Marble flooring, glass bulkheads and Claudette Bonville décor add to the feeling of luxury on board, while her four-cabin layout allows up to eight guests to be accommodated. 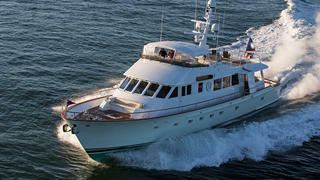 Designed by Gregory C. Marshall, the 39.62 metre motor yacht Endeavour was built in GRP by US yard Westport to ABS class and is MCA compliant with delivery in 2014 as a Westport 130 model. A European-style interior in satin finished anigre wood accommodates up to 10 guests in five cabins consisting of a main-deck master suite, two VIP suites and two twin cabins, all with entertainment centres and en-suite bathroom facilities. 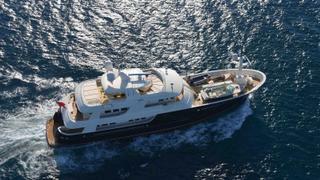 The 45.7 metre motor yacht Excellence was built in GRP by Richmond Yachts to ABS class and MCA coded with a design by Ward Setzer and delivered in 2010 as the largest yacht from the yard. An interior by Pavlik Design accommodates 10 guests in five cabins including an on-deck master suite. Below there are two further double and two twin cabins, all in a neutral decor and all with en suite bathroom facilities. 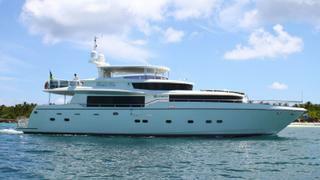 Designed by Don O’Keefe, the 35.97 metre motor yacht Fae Lon was built in aluminium by US yard Burger to ABS class and delivered in 2000 with her last refit in 2014. A voluminous interior in satin gloss finished quarter-sawn African cherry wood accommodates up to 12 guests in five cabins consisting of a main deck master suite, two VIP suites and two doubles, all with entertainment centres and en suite bathroom facilities. 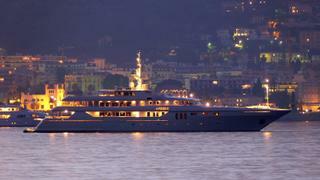 Designed by The A Group, the 59 metre motor yacht Helios was built in steel and aluminium by the Dutch yard Oceanco to Lloyd's class and MCA coded with delivery in 2001. An interior by Marc Michaels in light, neutral shades and pale woods accommodates up to 14 guests in seven cabins comprising a master suite, four doubles and two twins, all with entertainment centres, television screens and en-suite bathroom facilities. Built by Dutch yard Heesen and delivered in 1987, the 39.32 motor yacht Lionshare had an extensive refit in 2009 and her Clifford Denn interior combines pale tones, hardwood floors and dark wood highlights to create a contemporary, open-plan layout. 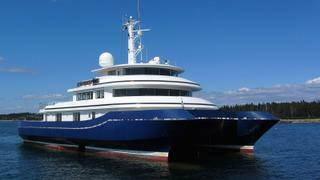 Accommodation is for up to 12 guests in five cabins including a main-deck master suite. 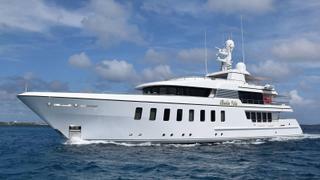 A 2005 launch for Dutch yard Feadship, Madsummer is a true globetrotting superyacht with a range of 4,800 nautical miles at 12 knots. Her interior was styled by British studio RWD and allows up to 10 guests to enjoy the utmost comfort and luxury while being attended to by a staff of 14. 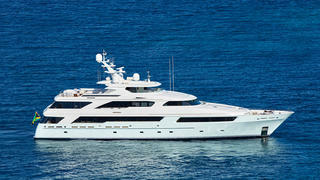 A 2009 refit saw her already high technical standards further enhanced and her exterior repainted. Built in carbon fibre-reinforced GRP by Japanese yard Nishii-Zosen to a design by Jon Bannenberg and launched in 1986 as one of the yard’s Sterling superyachts, the 44.81 metre motor yacht Matrix Rose (formerly known as Tooth Fairy) was refitted in 2008, 2010 and 2016, receiving over 400 improvements. Accommodation is for up to 12 guests in five cabins consisting of a main-deck master suite, VIP suite and three doubles, all with entertainment centres and en-suite bathroom facilities. In addition, there are quarters for 12 crew in six cabins. 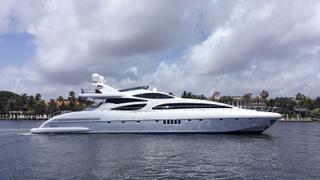 Built in GRP by Italian yard Overmarine, Me Gusta was delivered in 2007 as a Mangusta 130 model and benefits from a recent major refit. Accommodation on the 39 metre motor yacht is for up to nine guests in four cabins consisting of a full-beam master suite, VIP suite and two doubles, all with entertainment centres, flatscreen televisions and en-suite bathroom facilities. 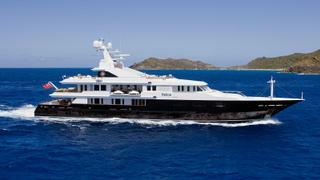 The 57.3 metre motor yacht Minderella was built in steel and aluminium by Dutch yard Feadship with naval architecture by De Voogt and interior design by Terence Disdale with delivery in 1986 and refits in 2003 and 2016. 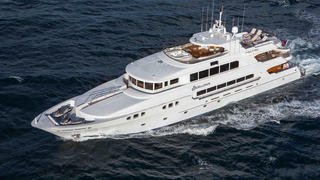 The latter refit, carried out at the Derecktor Shipyard in Florida, saw her receive new paint, entertainment systems, audio/visual equipment and soft furnishings. 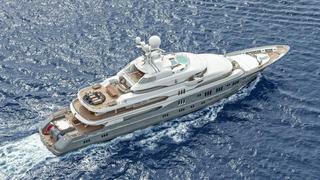 She went on to become a finalist at the 2017 World Superyacht Awards in the Best Refit category. Built in steel and aluminium by Italian yard Benetti to Bureau Veritas class, the 62 metre motor yacht Mine Games was delivered in 2010 and is MCA compliant. Flexible accommodation is for up to 14 guests in six cabins consisting of a three-roomed master suite, a VIP suite on the bridge deck, three doubles and a twin plus two Pullman berths. In addition, there are quarters for 16 crew members. 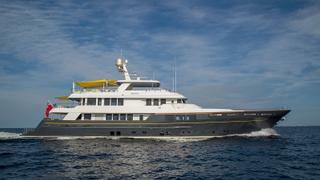 Designed by Terence Disdale, the 52 metre motor yacht Nita K II was built in steel and aluminium by the Dutch yard Amels to Lloyd's class and MCA coded with delivery in 2004 as one of the yard’s famed Tigre d’Or series, and most recently refitted in 2016. Her interior, by Alberto Pinto, features eight varieties of wood and other fine materials in a spacious interior accommodating up to 12 guests in five cabins. 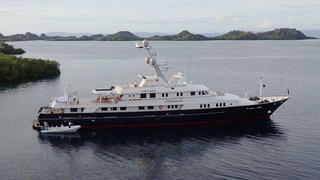 A Lloyd's-classed tri-deck motor yacht, the 42.29 metre Ninkasi was built in aluminium by Dutch yard Holland Jachtbouw to a design by Langan Design Associates and delivered in 2010. 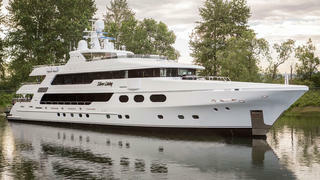 MCA compliant, her interior by Rhoades Young Design accommodates up to 10 guests in five cabins. The master suite is on the main deck and there are a further four cabins below, all with entertainment centres, Samsung television screens and en-suite bathroom facilities. Built in steel and aluminium by Dutch yard Feadship to a design by De Voogt, the 52 metre motor Rasselas was delivered in 1994 as a Lloyd's classed yacht and has been constantly upgraded since. An interior by John Munford bears all the hallmarks of his inimitable classic style and sleeps up to 12 guests in five cabins. These consist of a main-deck master suite with a king sized bed, two doubles with queen sized beds and two twins, each with a Pullman berth, and all cabins have flatscreen televisions, Crestron control pads and en-suite bathroom facilities. Designed by Sinot Exclusive Yacht Design, the 60.35 metre motor yacht Rock.It was built in steel and aluminium by Dutch yard Feadship to Lloyd's class and MCA coded with delivery in 2014. 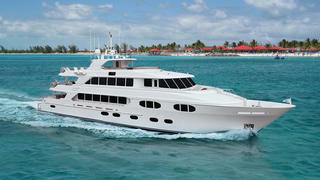 A luxurious interior with panelling in flame mahogany accommodates up to ten guests in five cabins. These consist of a full-beam master suite on the main deck, two VIP suites, a double and a twin, all with satellite televisions, access to the Kaleidescape on-demand audio and video system, and en-suite bathroom facilities. Designed by Sparkman & Stephens, the 39.32 metre expedition yacht Safira was built in steel and aluminium by US yard Newcastle Marine to ABS class and unrestricted MCA code with an ice-strengthened hull and was delivered in 2013. She accommodates 10 guests in five cabins with the full-beam master suite located deliberately below decks amidships, the position of least movement on board. All cabins have entertainment centres and en suite bathroom facilities. Delivered in 2012 by RMK Marine, the 45 metre motor yacht Scout was built to a Ron Holland Design and a Lloyd's MCA class with a steel hull, an aluminium superstructure and teak decks. Both the interior and exterior spaces were created by Design Unlimited. Up to 12 guests can be accommodated in five en-suite cabins, which includes a master cabin on the bridge deck, two king size cabins below and two twin cabins. 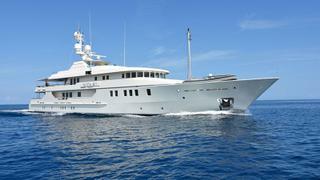 Delivered by Westport in 1999, the 34.38 metre motor yacht Seafarer underwent refits in 2013 and 2015/2016. 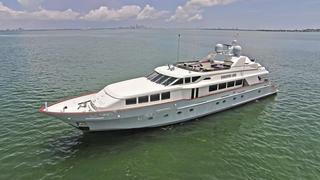 Built with a GRP hull, superstructure and deck, she boasts exterior design by Jack Sarin and interiors by Sheryl McLaughlin. 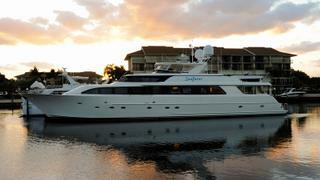 She can sleep up to eight guests in four cabins, with a crew of four. The master suite boasts a walk-in cedar-lined wardrobe and an enviable en-suite bathroom decked out in Crema Marfil marble. Built by German yard Abeking & Rasmussen to an in-house design, the 41 metre motor yacht Silver Cloud was delivered in 2008 as a SWATH (small waterplane area twin hull) model and went on to win a prestigious World Superyachts Award in 2009. Accommodation is for up to 12 guests in five cabins including a master suite, two doubles with king sized beds, two doubles with queen sized beds and a twin with Pullman berths. All cabins have entertainment centres, LED television screens and en-suite bathroom facilities. Built in GRP by US yard Christensen to ABS class, the 50 metre motor yacht Silver Lining was delivered in 2016 as the first superyacht from the yard since its buyout in 2015. Interior designer Kimberly Graham took full advantage of the massive interior spaces to create six cabins for 12 guests decorated in silk-finished black American walnut panelling. The cabin layout comprises a main deck master suite, two VIP suites, a double and two twins, all with entertainment centres, satellite television screens and en-suite bathroom facilities. Built in GRP by Taiwanese yard Johnson Yachts to a design by Bill Dixon, the 26.54 metre motor yacht Sixty-Six was delivered in 2002 as one of the yard's Johnson 87 series and is MCA compliant. 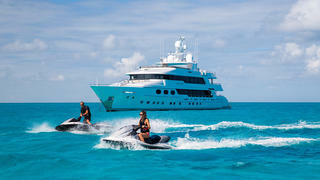 Accommodation is for eight guests in a master suite, VIP stateroom, double and a twin — all with en-suite facilities. One of most notable features is the main-deck master suite with a 180 degree panoramic forward view from the bed: unique on a yacht in this size range. Built in aluminium by US superyacht yard Trinity Yachts and delivered in 2010, the 57.91 metre motor yacht Skyfall features a sophisticated, modern interior designed by Patrick Knowles. A large saloon has comfortable seating, a 50-inch home theatre television screen and formal dining for 14 guests. Accommodation is for 14 guests in seven well appointed cabins. 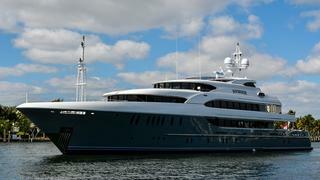 The 54.9 metre motor yacht Sovereign became the flagship of Newcastle Marine when she was launched in 2011, both the largest ship the American yard had ever built and the first hull of the Newcastle 5500 series. Built in steel and aluminium she has been upgraded continuously since her launch. Interior designer Claudette Bonville has created six luxurious cabins to accommodate up to 14 guests. Designed by Stefano Natucci, the 54 metre motor yacht Starfire was built in steel and aluminium by Italian yard Benetti with delivery in 1998 and was last refitted in 2012. MCA compliant, she has an Art Deco interior by Francois Zuretti accommodating up to 12 guests in six cabins consisting of a full-beam master suite on the main deck, a VIP suite, two doubles and two twins, all with entertainment centres, television screens and en-suite bathroom facilities. Built by Canadian yard Richmond Yachts to ABS class, the 46 metre motor yacht Status Quo’s exterior styling is by Ward Setzer working in conjunction with the yard and she was delivered in 2013. 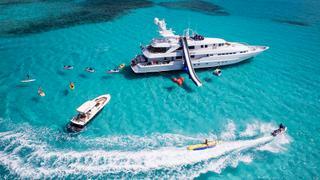 Accommodation is for up to 12 guests in a six-cabin layout plus crew quarters for a staff of up to eight people. The guest accommodation is configured as a full-beam main deck master suite, VIP suite, three doubles with queen sized beds and a twin cabin, all with full en-suite bathroom facilities. 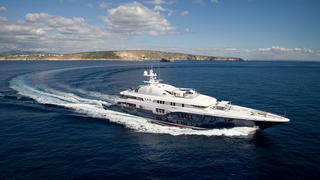 First launched in 1978 by Halter Marine, the 63.39 metre motor yacht SuRi was built from steel to Bureau Veritas standards. Refitted in 2012 and again in 2016, this 1,355GT displacement yacht now features a new timeless interior décor by Krilloff & Associates that creates an elegant, yet comfortable atmosphere. 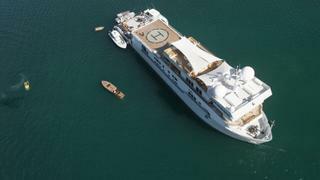 Her accommodation is split between seven cabins, including a master suite, four VIPs, a double cabin and a twin cabin, while a convertible cabin takes the total guest capacity to 15. 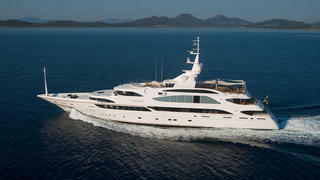 Built in steel and aluminium by German superyacht yard Nobiskrug, the 68 metre motor yacht Sycara V was delivered to her owners in 2010, becoming a subsequent winner at the 2011 World Superyacht Awards. 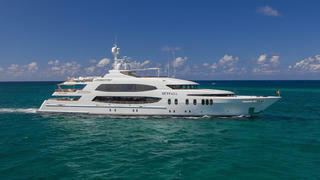 With exterior styling and interior design by Craig Bealeof Pure Detail, the interior of Sycara V is dedicated to spacious living, as can be seen on the main deck, which offers an open space of more than 25 metres from the dining room to the library, providing the feeling of living in a penthouse. 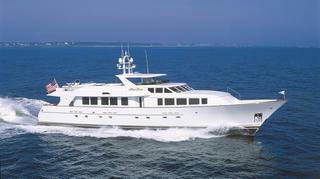 The 27.4 metre motor yacht Tumblehome was built in composite by Lyman Morse to a design by C. Raymond Hunt and with delivery in 1997 and refitted in 2013. Accommodation is for six guests in three cabins – all with en suite bathroom facilities – plus two crew. A comfortable family cruiser, Tumblehome has lots of deck spaces, including an ample aft deck lounge area, which was designed to be used for card games and al fresco dining. The 55.4 metre motor yacht Turquoise was delivered by Turkey’s Proteksan-Turquoise yard in 2011 and had a complete interior refit in 2014 by H2 Yacht Design. With naval architecture and styling by Dubois, this steel and aluminium superyacht offers the ultimate in cruising comfort for up to 12 guests. 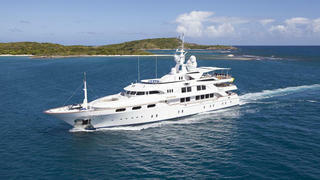 Her interior features a spectacular full-beam owner’s suite on the main deck, along with an equally opulent VIP suite. Four roomy en suite guest cabins - three doubles and a twin - are arranged around a central staircase and lobby. 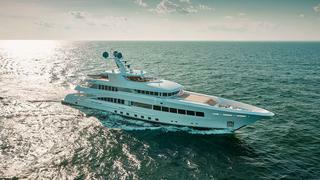 Designed by Espen Oeino, the 78.4 metre motor yacht TV was built in steel and aluminium by Lurssen to Lloyds class and delivered in 2008 with a refit in 2011. 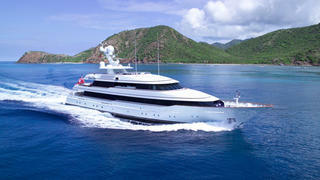 She went on to become a finalist at the 2009 World Superyacht Awards and featured in the 2010 edition of The Superyachts book. 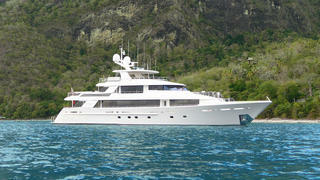 MCA compliant, TV features an interior by Alberto Pinto accommodating 16 guests in nine staterooms plus 25 crew. Built in GRP by US yard Delta Marine to ABS class and MCA coded, the 50 metre motor yacht Victoria Del Mar was delivered in 2006 with a major interior refit under the supervision of Claudette Bonville in 2014. 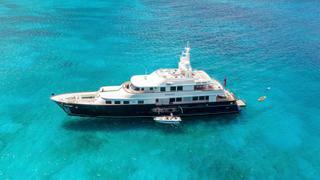 Accommodation is for 14 guests in seven cabins consisting of a master suite comprising the majority of the owner’s deck and featuring a spacious sky lounge, two twin VIP suites forward on the main deck, and two twins and two doubles below deck. All cabins have entertainment centres, television screens and en suite bathroom facilities. 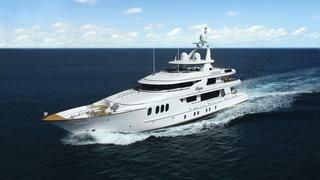 Johnson Yachts begins construction on "entry level superyacht"